Hi all! Time for another version of the easy tee. I used the colorblocked variation, just like in last week’s post, but this time I used knit fabric for the top and a woven (non-stretchy) fabric for the bottom portion. 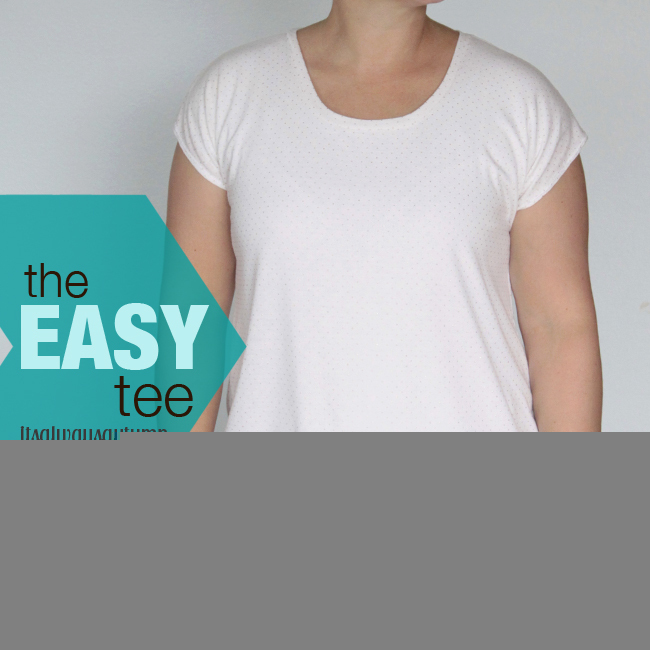 Since the easy tee is a loose top, using non-stretchy fabric worked just great! I actually upcycled fabric from a blouse I thrifted a few months ago, wore a few times, then realized was kind of horrible. The print was great, but the sleeves were kind of puffy and there was a weird neckline ruffle thing going on. Don’t ask me why I had to wear it two or three times before I realized how awful it was…just be glad I finally did. Anyway, I digress. 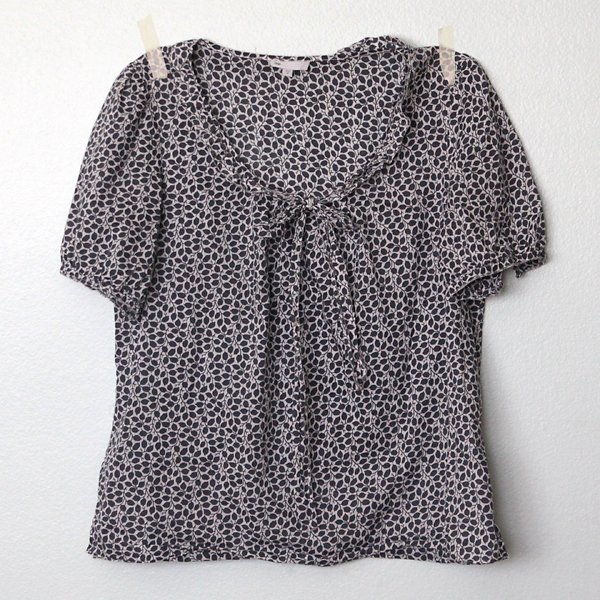 After I made this version I was looking at Anthropologie t-shirts (to copy, of course) and realized I had unintentionally knocked-off their pattern drop tee. 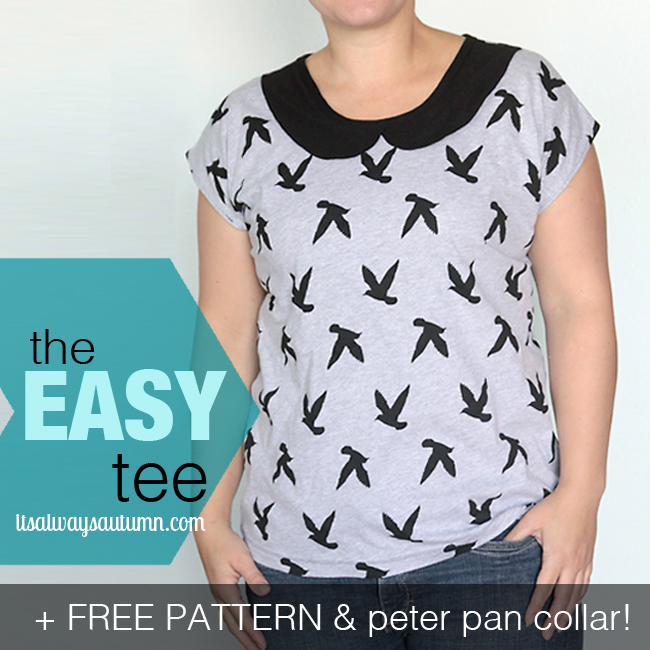 (Remember to check out the original easy tee, the peter pan collar version w/free printable pattern, and the colorblocked version. I’m totally twins with the Anthropologie model, right? Except there may be just a little difference in body types…maybe. What a great idea! think my husband has a couple of shirts that I might be able to steal and try that backwards idea with. Thanks for the great pattern! Fantastic!! Going to try this! 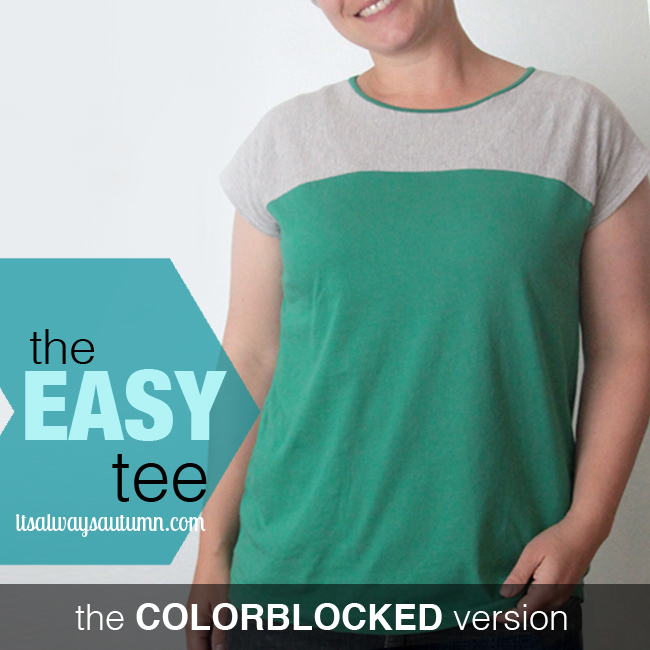 I have loved all of your easy tee variations. And the pattern drop is so much fun! I actually just made a similar top out of a men’s shirt with the buttons up the back. You can check it out here if you want. SOO cute! Pinning to try.. I really like this colorblocked version, although the one color is cute on you too! I really like your blog. 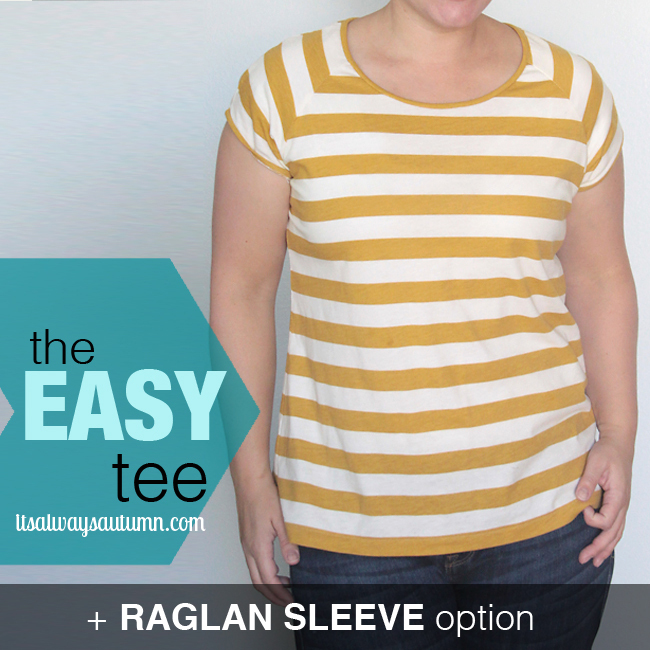 My favorite style of shirt are color block and Ragland sleeves. I also like the idea of recycling the big pink top into a modern version. just found your site and am loving it! hope to try out a tshirt soon. thanks for the inspiration!!! 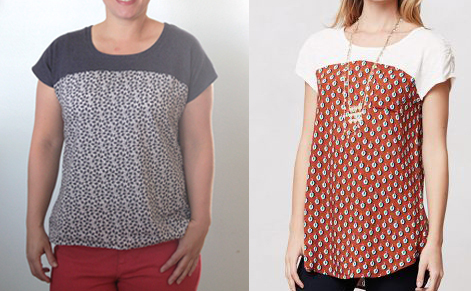 I love a good t-shirt refashion and if the inspiration is from Anthropolgie – all the better. 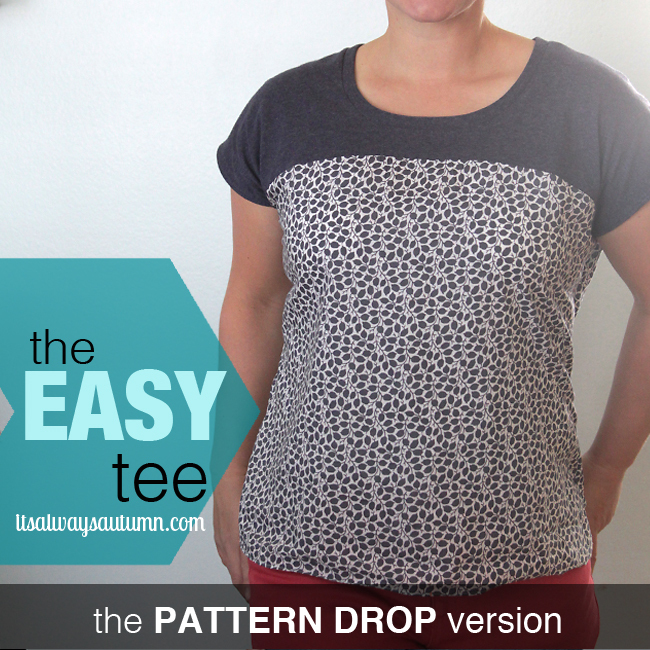 Just wanted to say thanks for the free pattern, I tried the original easy tee and the large fits me perfectly! I was wondering, with the pattern-drop version, which side seam option did you use? Would the “blouse-style” option be best since there is less stretch in a woven? Wanted you to know you were mentioned on PatternReview.com. How about drafting diff neckline options and a blouson version? Thanks for the current selection! OH MY GOODNESS!!! I LOVE YOU! You look like we share a similar body type and although I’m not heavy (neither are you) none of the ready made cute stuff fits. It seems all made for tall willowy skinny types. I love all of your shirt patterns and I’m getting to work for some comfy and cool summer shirts! Hey there! 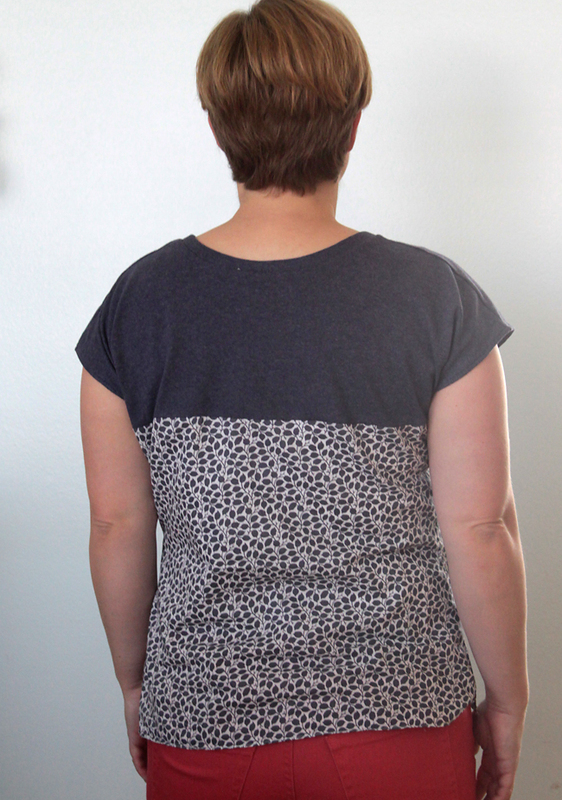 I’m a sewing newbie and am excited to try one of your tshirt patterns! I’m not sure which one I’ll start with, but I have a question. If I’m using new fabric rather than altering thrifted tops, how much fabric/yardage would you suggest I get? Could I pull off one of these tees in one yard? A yard and a half? I’m probably a size medium, but I’m totally digging that your patterns aren’t for super tight tops! Thanks in advance for your help!